A quick 8 hour drive on Monday followed by another 4 on Tuesday and we arrived at Heritage Village RV Park in Custer South Dakota. We spent Monday night at the Walmart in Casper Wyoming arriving at about 7pm. We had not had dinner yet and were craving a “home cooked” meal so Barb went into Walmart in search of a rotisserie chicken, mashed potatoes and another yummy salad Barb was going to find. She returned about 20 minutes later with nothing but a terrified look on her face. She said this was by far the scariest Walmart she had ever been in! She said not only were the salads were crusty and disgusting, the employees behind the counter were equally as scary! She was not going buy anything prepared behind that counter. After a quick pep talk and some encouragement, she went in for another round, we ended up with a couple of Zatarrin frozen dinners “home cooked” in our microwave. They were actually quite good. We arrived at Heritage Village RV Park about noon on Tuesday. It is located very close to Crazy Horse monument, in fact if you look very closely at the picture of our rig below you can see the monument above the satellite dish. We had chosen this RV Park as some fellow full-timers and bloggers Steve and Joan who are going to be working at the Crazy Horse Monument this summer were staying here as well. I had read on their blog they were going to be in the area and I emailed Joan to see where they were going to be staying. When we pulled in next to them I don’t know if they were happy to have visitors or thought we were stalking them! Barb and I have been following their blog for a few months and found that they could not have been nicer. We had a lot in common with them and really enjoyed the couple of hours we spent visiting and sharing experiences. I was happy to see that they were still there the next morning had not pulled up stakes and run for the hills during the night! They have been on the road for about 3 years and it was fun to compare notes and laugh about our lifestyle and some of the mistakes we make along the way. One that we laughed about is the amount of clothing we have (or lack of) and how in many of the pictures you see much of the same clothes over and over again. Many full-timers only have 7-10 sets of clothes to save room so there is not a lot of options from day to day. Yes, they are washed regularly (well, somewhat regularly) but you do tend to wear the same thing week after week. Having a full hookup RV site was nice as we have not had one for a while. We could use electricity and water without having to worry about how much water we had or if the sun was shining to recharge the solar. They also have separate shower facilities so we got to take showers every day! It has been one week since Daisy’s surgery and she is recovering well. What? You say I never mentioned her surgery before? Well, since we lost Bailey, Daisy has been a little more needy and barky. She was content being left alone with Bailey in the trailer or truck but now, not so much. She is slowing adjusting to being alone and is getting better but we decided to get her de-barked. The last thing fellow campers want to hear is a dog barking in the trailer next door. She went in for the procedure last Tuesday and she is not supposed to be left alone and kept quiet for two weeks. So once fully healed, if she does bark, it will be a soft whisper bark instead of the loud annoying bark. We spent a cold and rainy Wednesday driving around exploring various trout streams and potential campsites. Most of the trout streams in the area are very small and you could jump across them in most spots. We walked a few of the stream/creeks and did see some trout but most of them were no more than 7-8”, hopefully the bigger ones are hiding in some deeper holes. We bought licenses…now that we are residents they are much cheaper and we got the combo hunting/fishing in anticipation of next fall. We are going to move campsites and hit the streams. We found an awesome US Forest Service Campground that had about 15 sites with nobody there at all! Granted, we had to drive snow covered gravel roads to find it but we will have it all to ourselves. We visited about 5 US Forest Service Campgrounds today, none of them had anyone in them due to it being so early. We found 3 we could get the rig into, two that we would stay but one of them was closed “due to lack of funding”. In the end the one we are staying at is the one we would have picked out of them all anyway. Thursday and Friday were spent in solitude at the Ditch Creek Campground 14 miles outside Hill City and very close to Mountain Meadows campground where we have stayed both horse camping and turkey hunting in the past. We spent two days relaxing and fishing. The fishing was fantastic, we caught countless brook trout and rainbows. They were hitting a red worm imitation flies. I got a chance to try out me new GoPro video camera and took some videos catching and releasing some fish. The camera is waterproof so I got some nice shots of a couple trout as they were swimming away after we released them. This picture is for you Steve! We cook several of the larger ones (15”+) over the open fire both nights for dinner. After dinner it was time to pack up so we could hit the road bright and early and head east to Wood South Dakota where we are to meet some friends from Wisconsin! We had a great day with the kids on Easter over at Jessica and Shane’s house. Forrest and Somer went to Brighton snowboarding in the morning as it was the last day the slopes were going to be open. They met us later in the day for a dinner prepared by Jessica and Barb topped off by raspberry dessert! We had an Easter egg hunt in the backyard where Dylan and Lily found plastic candy filled eggs and a couple of toys. Lily was running around finding eggs but once she discovered there was candy in them she would stop to eat the contents before looking for another. Dylan on the other hand was interested in quantity. I was impressed however when he stopped what he was doing and got Lily back on track by helping her fill her basket. After dinner we got together for our very first family picture. Trying to get a 4 and 2 year old to stand for pictures is like trying to herd cats. It makes me wonder how my mom handled 7 children! Dylan and Lily should be shifted a little to the left in front of their respective parents but with only a 10 second delay on the camera timer we were not going to mess with fate. After pictures we said our goodbyes, we should be back in 6 months. It was a good visit here in and we will miss seeing everyone but it is time to move on. Speaking of missing people, this is the first Easter in quite some time that we did not have Easter with some of my brothers and sisters, we missed them as well. Today we start our journey to South Dakota to meet some friends for a bow hunt for the wiley South Dakota turkey. We will likely spend the night in Casper, stop in Custer for a few days before meeting our group in Wood, SD on Saturday. Our son Forrest and his wife Somer had been planning a camping trip for this weekend and we decided to tag along for an additional adventure. They had originally planned on camping in the Bryce Canyon area. After doing a little research we found that very few trails in this area were dog friendly so we found a kennel to take Daisy for the weekend and prepared to hit the road early Saturday morning. The kennel we had found was about 30 miles outside Bryce and would pick up and return your dog each day so they do not need to spend the night in the kennel. Friday arrived and a quick check of the weather showed snow and temps in the 20’s in the Bryce area so we did some quick research and found the Moab area was not only going to be much warmer but there are many dog friendly areas as well. #3 which was Big Bend Campground. There are 3 sites in this campground that we would fit in, all three were taken but it looked like one was packing up. A few minutes later the site was open and we pulled Forrest’s truck in and I called Barb telling her to head on up. It was a tight fit but Barb backed it in like a pro! I am still impressed with the number of friendly people we run into. One guy offered to move his jeep while Barb was backing up and another offered to let us park our truck in his site when we unhooked. Big Bend is right on the Colorado River and our site had a little sandy area right on the water. Saturday we spent in the campground playing and relaxing. Forrest cooked a huge tri-tip sirloin on the fire topped off with a few smores before bed. Sunday we woke up to rain and it stuck around pretty much all day. We went for a drive and explored a few more campgrounds and hiked one area when the rain paused. We spent the afternoon relaxing in the trailer listening to the rain and watching The Masters golf tournament. Barb braved the elements and went out and started a fire, our plan was to cook hobo dinners on the fire. For those who have never had a hobo dinner it is basically a mix of meats and vegetables wrapped in aluminum foil and cooked in the coals of the fire. Ours consisted of burger, chicken sausages, potatoes, onions and carrots. 20 minutes in the coals and they were ready. There is something about cooking on a campfire that makes everything good! That night the rain stopped but the cold set in, when we woke up in the morning there was ice on the puddles, the slideout awnings and anywhere the rain had pooled. Forrest, Somer and Lily toughed it out and spent the whole night in their tent. After packing up camp it had warmed up nicely and we headed to one of the dog friendly trails on the Corona Arch Trail. It is about 2 miles each way with moderate climbing. There were a couple of where the climb is steep but overall it is pretty easy. The terrain in the area is absolutely amazing! Buttes, arches, wind and rain holes or just the color of the terrain in incredible. It is amazing that anything can live in this area and obvious that it is a tough existence for both plants and animals. Even Pikachu made an appearance! Despite the weather, it was a great weekend. The short time we spent there was not nearly enough and we are definitely going to come back and stay longer. When we arrived back on the Lindon Marina on Monday afternoon we found that we had missed one heck of a storm with reported winds over 60 miles per hour! 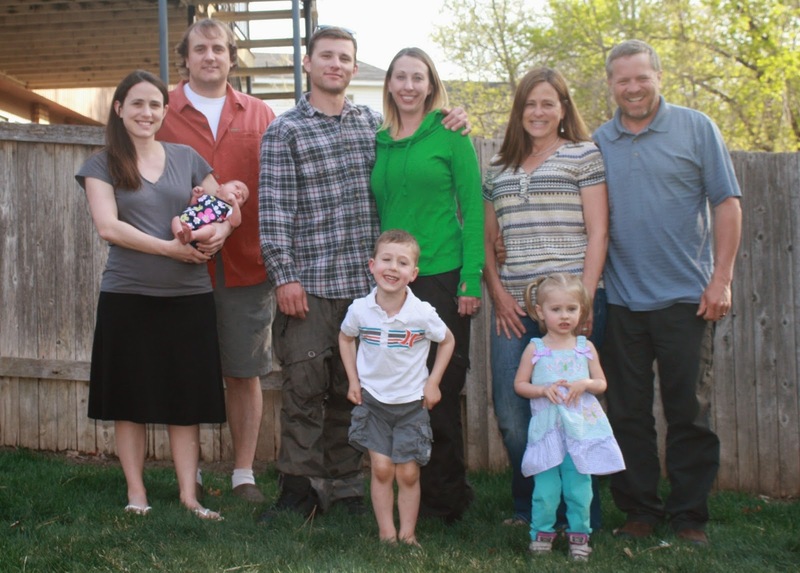 This week we are looking forward to spending more time with the kids, planning our route to South Dakota and ending the week with the first Easter where we were all able to get together in probably 10 years! The start of week #5 and we have not killed each other yet! There have been a few close calls….. I have hidden all the guns, knives and other sharp objects. Just when I thought it was going well I caught her making a schive out of her toothbrush and dinner tasted a little weird last night. This week has been filled with more visiting and fishing. We have been by to see Jessica and Kendall a few times. She continues to get cuter and cuter. Jessica is doing and looks great, she went home Tuesday afternoon and is now missing the quiet time, meals served to her and oh yeah, don’t forget the meds! The nurses on the other hand were probably glad to see her go. Since Jessica works on this floor and with these nurses on a daily basis she is a little too aware of how things should go and what to ask for. It was humorous seeing her ask for things that I could not pronounce let alone try and spell! We spent some time with Dylan at the trailer fishing, playing and just hanging out. Forrest, Somer and Lily have been out a few times as well, it is good to see all the kids so often! Speaking of fishing, we have been getting a lot of fishing time in. 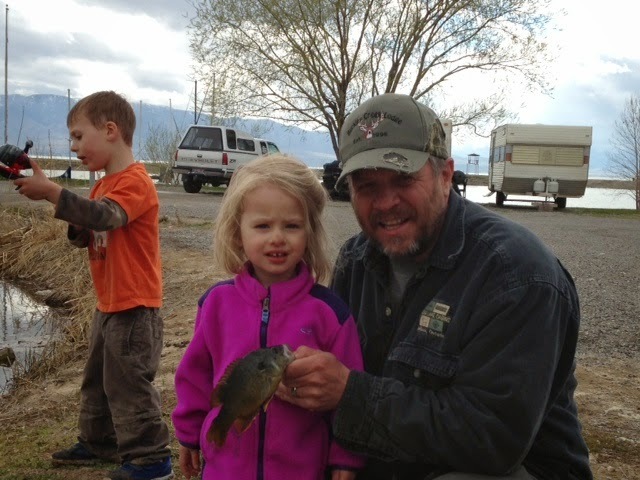 Dylan and Lily each caught a few sunfish and Barb caught her first Utah brown trout! You should have seen her landing this thing…without a net, it was a combination of reeling and dragging it backwards up onto the bank. Even she said she may have overacted but she landed it! Forrest and I had a successful outing for catfish in the marina as well. Not being a catfisherman, I did not know how to clean and cook it but a quick YouTube video and we were good to go. Barb made a Cajun sauce and it was delicious! Today I am doing lazy man’s fishing. I have a pole out on the shore in a holder, an anchovy on a hook and a bell on the end of the rod waiting for the big one to bite. Looking back at the last four weeks we have not had a moment of regret…… granted we have had our ups and downs, challenges and frustrations along the way, but those come with any lifestyle you choose. The top of these were losing Bailey and our adventure down the goat trail on our way to find Bear Mountain RV Park where we sustained scratches on both sides of the trailer trying to squeeze down a tight driveway. A little rubbing compound and wax should have it back to new in a few hours. One thing we have struggled with is slowing down and enjoying the road. We had preplanned our primary destinations as well as a number of secondary stops along the way. While we have enjoyed all our primary locations, we have yet to see any of those secondary stops we had planned. Instead we sped right past them in an effort to get to our next stop. Being newbies, one challenge was choosing campsites along the way, having never been to many of these areas we had no idea whether our rig would fit into the sites or whether it was a nice place or not. Lots of research on the internet helped us along the way. One thing we discovered is that you must make campground reservations in Oregon on line 24 hours in advance rather than just arriving and picking a site. We were able to work things out but this is something we will have to remember in the future. The only site we have been to so far that we would not return is Mountain Shadow RV Park in Draper Utah. It was convenient as it was right between the kids but we would not stay there again. We are also learning a lot about our new solar system. We have not been hooked up to power now for over two weeks and so far have been able to live as we normally would. The solar operates everything in the rig except the AC and the propane refrigerator. It looks like we could operate about 3 days on a full charge using lights and TV as normal. Luckily, the weather has been sunny and it recharges every day. We do have a backup generator should we have a string of cloudy days. Other newbie learnings is testing out our budget….. Fun times! We had done a lot of research on RV living and the associated costs. Some live on as little as $12,000 a year while others spend 10 times that. Our budget is near the lower-middle of that spectrum and so far we have been having a hard time sticking to that. There are a lot of up front expenses; vehicle registration, insurance, solar installation……. Camping expenses have been right about where we thought they would be at about $350 a month. We have paid as much as $30 a night and have had a few free nights but on average dry campsites are about $10-$15 a night. Fuel has been a little less than we expected at $1,800 for the 4 weeks averaging 10.22 miles per gallon. Unexpected expenses were about $600 the majority of which were vet bills. On top of all that we need to realize that we do indeed have a budget and cannot just buy things because we want them or want to pick them up for the kids. Barb does have a couple of gift cards that we are using on “fun stuff”; thank you to Vicki K. for the gift card which is used exclusively on Dairy Queen, Jean M. for the Starbucks gift card! We also have one reserved strictly for our alcohol purchases but that one is going way too fast! On the upside many of these one-time expenses are now paid and we should have a pretty expense-free summer in Canada. We had two deliveries today! We are excited about both......I just don't know which one to talk about first! Our new granddaughter or our South Dakota turkey tags! For the sake of family harmony I better talk about our granddaughter. Kendall Lynn Mowen was born at approximately 2:14pm coming in at 7lbs 4oz, 20 1/2". Jessica, Kendall and Shane are all doing fine. Jessica went in yesterday and spent the night in the hospital. They decided to induce her today but that did not work....they were just getting ready to release her about noon today when things started to happen fast! Unfortunately the first part of Kendall to start coming out was not what they wanted to see so they did a quick C Section and a few minutes later, she was born! 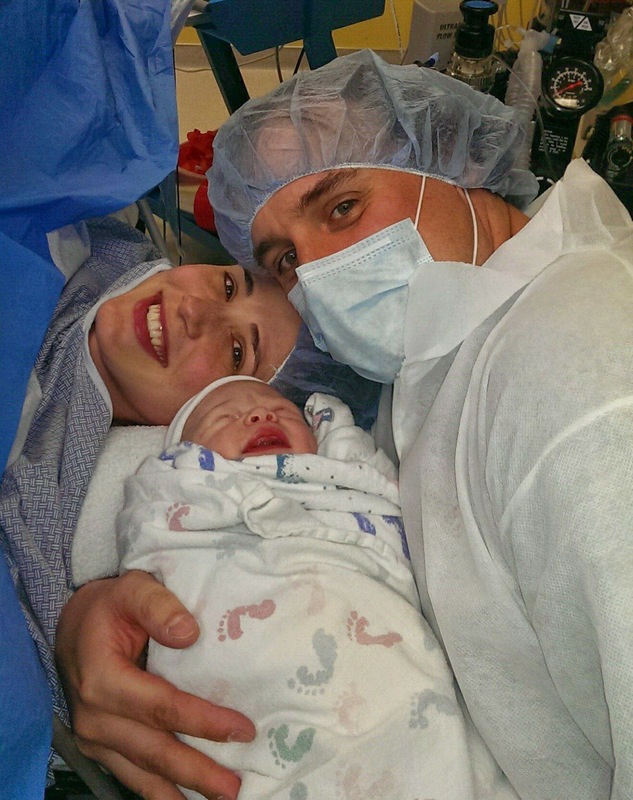 We are very happy for Jessica and Shane and are proud to have our third grandchild! Now can I talk about the turkey tags? We got our first mail delivery today.....we use a mail forwarding service out of South Dakota and they forward our mail to is once a month. We have most of our items sent up electronically so it is not a big deal to get it only once a month. We got our SD license plates and our long awaited turkey tags! This will be Barb's first SD turkey hunt....although she seems be hiding her excitement very well....I know deep down she is totally psyched.